Daklinza (daclatasvir) is drug used in combination therapy for the treatment of hepatitis C (HCV) for adults 18 years of age or older. Daklinza works by blocking a protein called NS5B (non-structural protein 5B) that HCV uses to replicate its RNA, effectively interrupting a stage in the virus' life cycle. Daklinza was approved in July 24, 2015, by the U.S. Food and Drug Administration for patients with chronic genotype 3 HCV infection, including those with cirrhosis. Daklinza can be used​ in both previously untreated (treatment-naïve) patients, as well as previously treated (treatment-experienced) patients who had partial or no response to prior HCV therapy. Clinical research has shown that the cure rate for treatment-naïve patients on a Daklinza-based therapy is 98%, while the cure rate for treatment-experienced patients with cirrhosis is 58%. One 60 mg tablet taken daily with or without food in combination with Sovaldi (sofosbuvir). The recommended duration of therapy is 12 weeks. The dose may need to be adjusted for patients taking either a CYP3A inhibitor or a CYP3A inducer (see list below). Failure to do so may reduce the therapeutic effect of Daklinza, as well as increased the likelihood of drug resistance. In such cases, it is recommended that dosage be decreased to 30 mg once daily with a strong CYP3A inhibitor and increased to 90 mg once daily with a strong CYP3A inducer. Daklinza is prescribed for use in combination therapy with Sovaldi and must never be used as monotherapy. Daklinza is available in 30 mg and 60 mg oral tablet form. 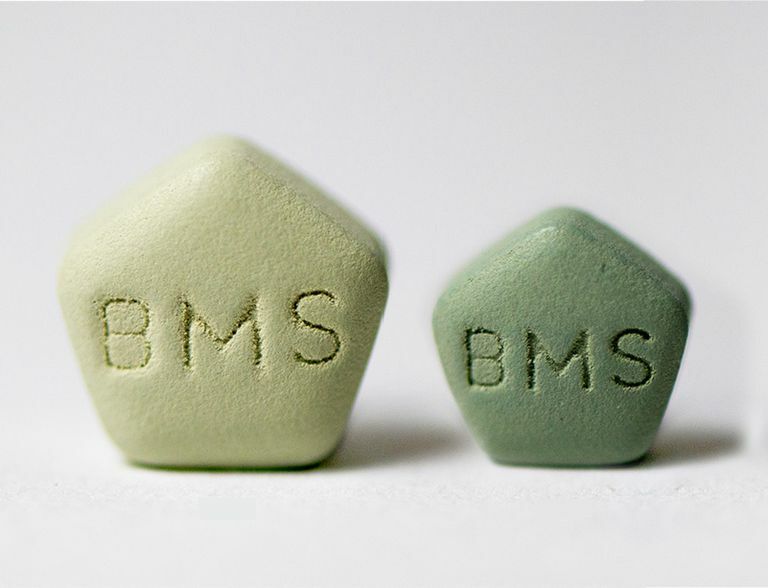 The 30 mg tablets are light green and pentagonal in shape, with "BMS" embossed on one side and "213" on the other. The 60 mg tablets are also light green and pentagonal in shape, with "BMS" embossed on one side and "215" on the other. Always advise your doctor about any drug you may be taking, including over-the-counter medication or those prescribed by another doctor. Daklinza can cause the serious slowing of the heart rate (bradycardia). There have been cases in which patients have had to receive pacemakers after taking antiarrhythmic drug, amiodarone, with Sovaldi in combination with another HCV direct-acting antiviral, including Daklinza. Co-administration of amiodarone with Daklinza and Sovaldi is not recommended. If no other alternative is available, cardiac monitoring is strongly recommended. While animal studies have shown no evidence of fetal damage when exposed to Daklinza during pregnancy, the use of Sovaldi is contraindicated for such use. Daklinza/Sovaldi combination therapy must not be used during pregnancy. Women of child-bearing age and their male partners should also use two forms of contraception when taking Daklinza/Sovaldi. The safety of Daklinza is patients with liver transplants has yet not been established. U.S. Food and Drug Administration. "FDA approves new treatment for chronic hepatitis genotype 3 infections." Silver Spring, Maryland; press release issued July 24, 2015.